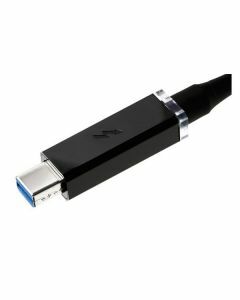 Thunderbolt Optical Cables by Corning unleash the brilliance of light to connect computers and devices at incredible speed and over longer distances. They’re thin, light and remarkably tough — Optical Cables by Corning can be bent, squeezed, and tangled. The future of device connectivity flows through Optical Cables by Corning.